Ontarians visit hospital emergency departments (EDs) at times of crisis, and when no other options are available. For many people with mental illness and addiction, the ED visit is their first point of health care contact. 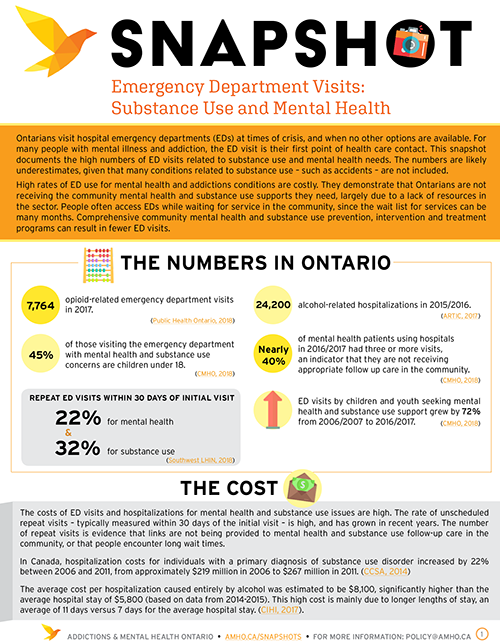 This snapshot documents the high numbers of ED visits related to substance use and mental health needs. The numbers are likely underestimates, given that many conditions related to substance use – such as accidents – are not included. 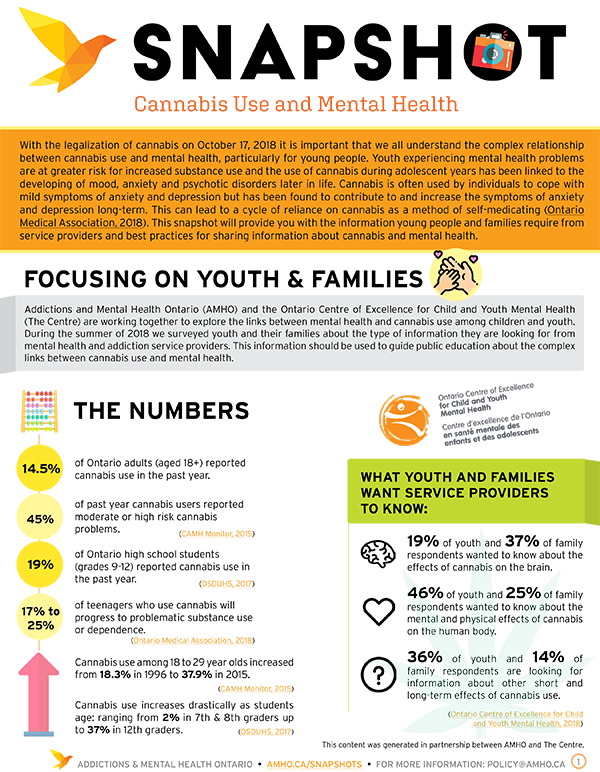 With the legalization of cannabis, it is important we all understand the complex relationship between cannabis use and mental health, particularly for young people. Youth experiencing mental health problems are at greater risk for increased substance use and the use of cannabis during adolescent years has been linked to the developing of mood, anxiety and psychotic disorders later in life. Cannabis is often used by individuals to cope with mild symptoms of anxiety and depression but has been found to contribute to and increase the symptoms of anxiety and depression long-term. This can lead to a cycle of reliance on cannabis as a method of self-medicating. This snapshot will provide you with the information young people and families require from service providers and best practices for sharing information about cannabis and mental health. ALC designation is given when a patient has completed treatment and no longer requires the intensive supports provided in the hospital setting, but remains in hospital because they do not have a home to return to with the supports that they need. One quarter of all ALC patient days are patients requiring mental health services waiting in hospital to be discharged to a more appropriate setting. 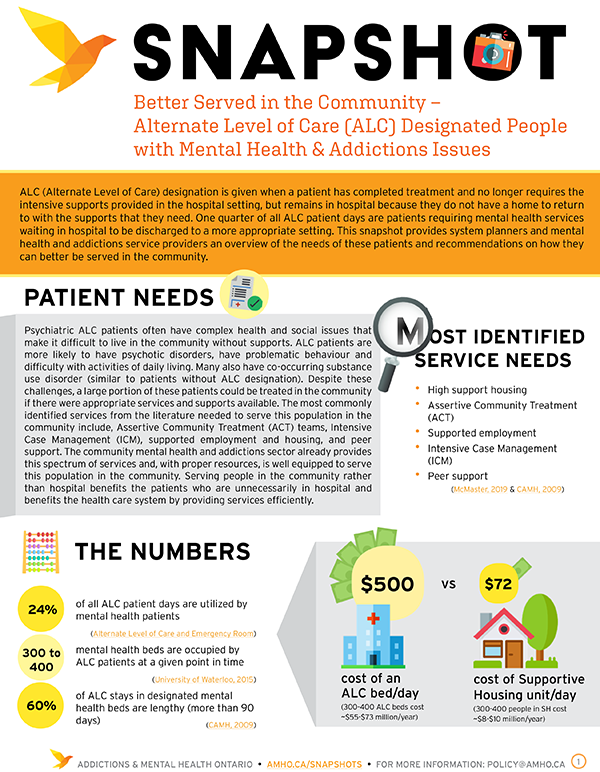 This Snapshot provides system planners and mental health and addictions service providers an overview of the needs of these patients and recommendations on how they can better be served in the community. Trans people face disproportionately high rates of mental health and addictions issues, yet face many barriers to care including violence, harassment and discrimination. 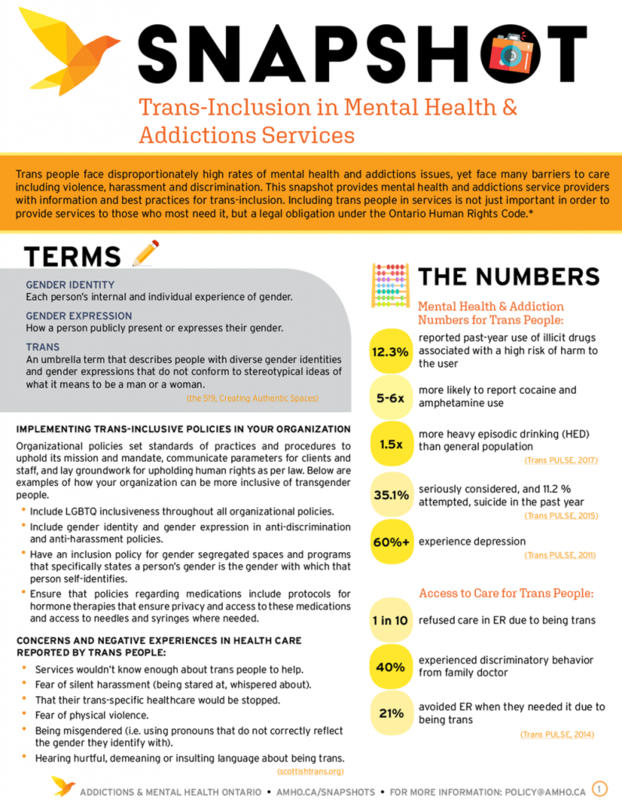 This snapshot provides mental health and addictions service providers with information and best practices for trans-inclusion. Including trans people in services is not just important in order to provide services to those who most need it, but a legal obligation under the Ontario Human Rights Code. Do you have questions or comments about these Snapshots? Feel free to reach out to AMHO’s Policy Team at policy@amho.ca.